November 18, 2015 – Uri Eliahu was inducted to the Academy of Distinguished Alumni on October 8, 2015. He received his B.S. (1981) degree in Civil Engineering from the University of California, Berkeley. Since 1986, he has worked at ENGEO Incorporated, holding numerous positions from Project Manager in 1986 to President and CEO in 1992, the position he has held for the past 23 years. The Civil and Environmental Engineering Department (CEE) at the University of California, Berkeley recognizes many alumni whose accomplishments have contributed significantly to societal well‐being and development, both in the US and around the globe. 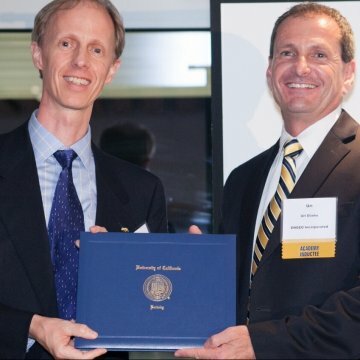 In this context, CEE leadership and faculty, aided by the generosity of its Advisory Council and the guidance of the College of Engineering, established the CEE Academy of Distinguished Alumni (Academy) in 2012.
further enhance the stature of the Cal CEE Department by shining a light on the many great accomplishments of its graduates. Under Mr. Eliahu’s leadership, ENGEO has grown as an international engineering and consulting firm to more than 250 employees with 7 offices in California and 3 in New Zealand. Founded in 1971, the firm has for more than a decade been consistently ranked based on employee surveys as one of the top 10 places to work in the United States. ENGEO’s practice focus is in the areas of geotechnical engineering, environmental engineering, hydrologic engineering and related earth sciences involving transportation, infrastructure, flood control, landslide repair and risk mitigation, mixed-use development, urban infill development, and redevelopment of Brownfields, industrial sites, and military bases. In recognition of his professional accomplishments, Mr. Eliahu was voted Businessman of the Year by the San Ramon Chamber of Commerce in 2008, was a recipient of the ASCE San Francisco Chapter Civil Engineer of the Year Award in the Private Sector in 2009, was named Most Admired CEO of the Year in the Professional Services category by the San Francisco Business Times in 2010, and was inducted into the San Ramon Rotary Hall of Fame in 2010. During his tenure at ENGEO the firm has been the recipient of numerous Outstanding Project Awards and Awards of Merit from ASCE, ACEC (formerly CELSOC), and CalGeo (formerly CGEA). A long-time supporter of the Berkeley CEE Department, Mr. Eliahu established the ENGEO Fellowship in Geotechnical Engineering and consistently provides internship opportunities for CEE undergraduate students. He also currently serves on the CEE Advisory Council.